-the three brightest and biggest galaxies as seen from Earth : the Milky Way (our galaxy) and the large and small Magellanic clouds (at the bottom right of the image). -the two brightest and biggest (and also most famous) emission nebulae of the sky : The Eta Carina Nebula and the Orion Nebula (M42). 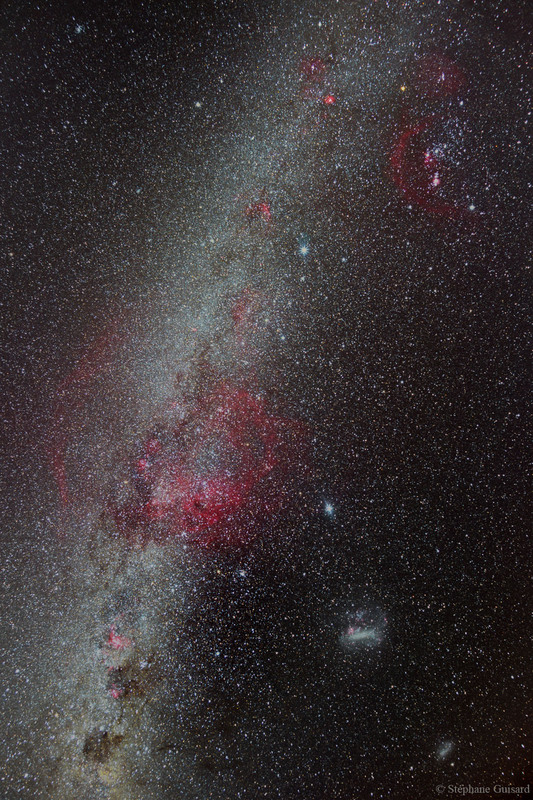 The whole image has also many other Halpha nebulae. For example, from top right to bottom left : LBN865 just above Orion, the Barnard loop around Orion, the horsehead nebula region and M42 inside the Orion constellation. To the left of Orion are the bright Rosette nebula with the cone nebula region above it. Top left of Sirius is NGC2327 and diffuse SH2-310 at its lower left. The big red ring in the middle left of the image (more than 40 degrees in diameter ! ), is the Gum Nebula (named after Australian astronomer Colin Stanley Gum),it is the remanent gas ring of an ancient supernova more than 1 million years old. At the bottom left of the image, is the rich region containing Eta Carina Nebula area , the Southern Cross constellation and Coal Sack region.. If you are getting lost ..... you can get a help with this labelled image. 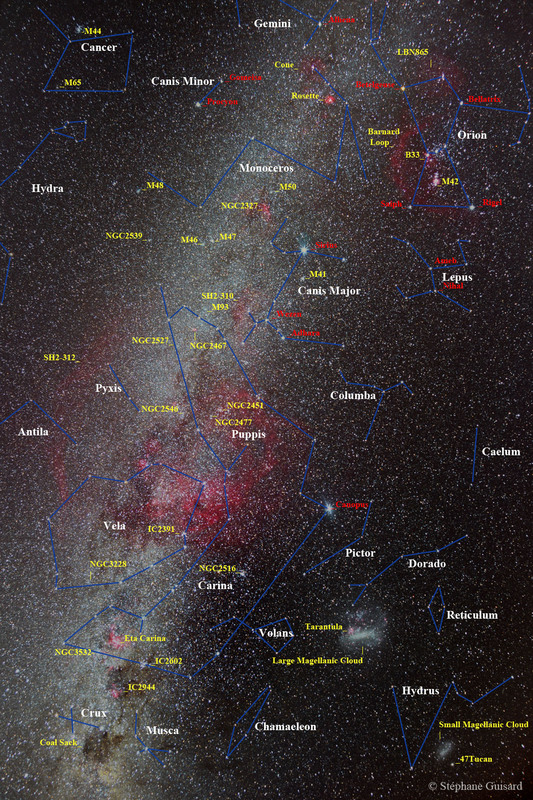 Labelled image (with white text for the constellations Latin name, red for stars name, and yellow for objects name or catalogue number).